This website is dedicated to the Lotus Esprit Turbo X180, or as it is commonly known as the "Stevens" Esprit. 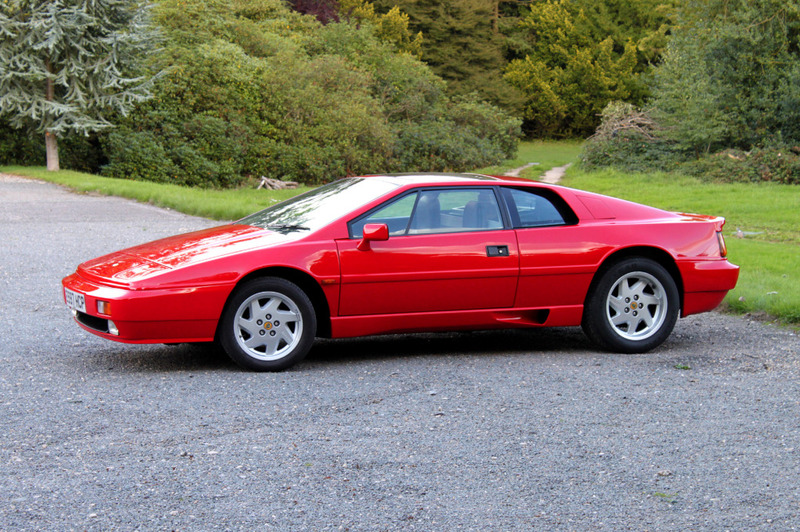 The Lotus Esprit Turbo was built from 1980 to 1992. In it's day, it was one of the fastest accelerating cars, with impressive handling and a top speed to matched most supercars of it's day. By 1987, the original Lotus Esprit was looking a little long in the tooth and needed an update. Lotus employed Peter Stevens to redesign the car, retaining the essence of the original design, but giving it a more contemporary appearance. 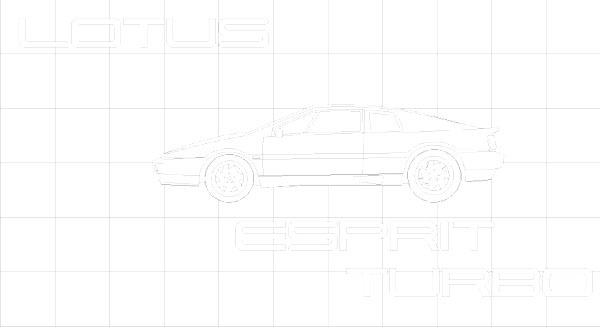 Below is a brief history of the Lotus Esprit. The Lotus Esprit has been one of the most successful and longest running supercars, produced from 1976 until 2004, and was developed and improved over time. The car was famously popularised by the James Bond films, The Spy who loved me and For your eyes only. The Lotus Esprit began life in 1972 as a concept car (the "Silver Car"), which was displayed at the Turin Motor show. Sat next to the Maserati Boomerang, it stole the show. The original Esprit was design by Giorgetto Giugiaro's of Ital Design as a styling exercise. He had met Colin Chapman the year previously, from a chance meeting and Chapman commissioned the new Lotus and as a result, decided to put the car into production. The Lotus Esprit (or Kiwi as it was initially known) was developed over 3 years and launched in September 1975, to replace the long running Lotus Europa (although Owner's had to wait till 1976 to collect their cars). Like its forebear, the Lotus Esprit was a GRP-bodied, mid-engined sports car with a steel backbone chassis, but that's where the similarities end. Whereas the Europa was aimed at the sports car market, the new Esprit was aimed towards the luxury supercar market; ie. Porsche and Ferrari. From 1975 to 1978, the Lotus Esprit S1 was produced. Power came from the 907 engine, also used in the Lotus Elite and Eclat. Although the car looked stunning and the handling was impressive, the car only managed a top speed of 126 mph. There were also problems with unreliability, dubious build quality, engine ventilation and electrical problems and the first owner of the cars, were often regarded as guinea pigs. The Lotus Esprit was developed and improved with the introduction of the S2 from 1978 to 1980. This car had improved engine ventilation, with the air intakes behind the rear windows and an integrated splitter under the front bumper. The S2.2 from 1980 -1981 had a larger 2.2 litre engine (912 series twin cam) and a galvanized chassis. It was the introduction of the Lotus Essex (Turbo Esprit) in 1980 that brought the car into the supercar league. There were 104 Essex branded cars built (with dry sums). There were big improvements in reliability and chassis design (better torsional rigidity) and revised rear suspension geometry (the drive shaft no longer doubled up as the top link but was supplemented by a transverse link). These improvements also followed through to the normally aspirated S3 model of 1981. The Lotus Turbo Esprit was powered by the improved 910 engine and featured an AiResearch Garrett T3 turbocharger, which helped increased the engine power to 210 bhp. This gave the car an overall top speed of 153 mph and 0 - 60 time of 5.4 seconds. In 1981, the Essex name was drop and it was renamed the Turbo Esprit; with conventional livery, optional leather seats and air conditioning and a cheaper stereo, which brought the price down and increased sales. In February 1987, the Turbo Esprit HC was introduced with a high compression engine, more boost, improved carburetion, lubrication and cooling and the engine power was increased to 215 bhp. The new-style Lotus Esprit Turbo was designed by Peter Stevens. Code named X180. Lotus spent £2 million on the development and design of the car. Worked started in October 1985, with sketches and colour renderings. A full-size fibreglass mock-up was created in February 1986 and the final design was approved in July of that year. The new Lotus Esprit Turbo was launched in October 1987, with deliveries beginning almost at once. The finished car was mechanically the same as the previous Giugiaro styled Turbo Esprit HC, other than the transaxle and gearbox. In place of the previous Citroen unit, Lotus fitted the Renault GTA transmission. The new gearbox also meant a change in the rear brakes. These became outboard, mounted on the cast alloy hub carriers. Inside the car there was more legroom, an updated instrument display, revised door panels and seats and better ventilation. Head/ block al. alloy/al alloy. 4 cylinders in line. Valve gear 2ohc. 4 valves per cylinder. Compression ratio 80 to 1. Max power 215bhp (PS-DIN) (160kW ISO) at 6000rpm. Max torque 2201b ft (298 Nm) at 4250rpm. Front, independent, double wishbone. co-axial coil springs, telescopic dampers, and-roll bar. Rear, independent, upper and lower transverse link with radius arms, coil springs, telescopic dampers, anti-roll bar. 2.9 turns lock to lock. Front l0.1ins(258mm) dia ventilated discs. Rear l0.8ins (275.9mm) dia discs. Al alloy,7ins rims front. 8ins rear. Lotusespritturbo.com is a none-profit making website. Advertising pays for the running of the website.